Sriya:pathi SrIman nArAyaNan ensures that His devotees reach HIM. In order to do this successfully, he imparts in them, the desire to reach HIM. This desire gradually blossoms into para bhakthi, para gyAna and parama bhakthi. SrIman nArAyaNan created such a gradually refined bhakthi for nammAzhvAr and accepted him finally with his physical body. nammAzhvAr himself says about this in “mayavaRa madhi nalam aruLinan (thiruvAimozhi 1.1.1) ” and “avAvaRRu vEdu peRRa (thiruAimozhi 10.10.11)”. It is because of the association with nammAzvAr that everyone is able to experience a gradual transformation of the desire to para bhakthi, para gyAna and parama bhakthi. This is why our ancestors have yearned for the bhakthi that was bestowed upon by sriman nArAyaNan to azhvAr. The phrases like “bhagavan bhakthimapi prayachchamE” and “parabhakthiyuththam mAm kurushva”. Having yearned for such bhakthi, there were lot of ancestors who have transcended this materialistic place to the permanent and eternal abode of sriman nArAyaNan, namely srivaikuntam or paramapadham. These ancestors were able to transgress this world and go to parapadham with sriman nArAyaNan’s causeless cause. The representative for such a group of ancestors, are typically parAnkusan (nammAzvAr) and parakAlan (thirumangai AzhvAr). In such an elite company is SrI rAmAnuja in paramapadham. SrI rAmAnuja’s glory is not just that but in fact is endless. He is the sole refuge of all the people who have the desire to go to paramapadham. He manifests himself in archA (deity) form not only in the divyadEsams and other temples but also extends it to their respective homes. To such a SrI rAmAnuja, thiruvAimozhi piLLai surrendered after realizing that he (thiruvAimozhi piLLai ) is unqualified to go to paramapadham and does not have any merits in his (thiruvAimozhi piLLai’s) favor. Eventually, SrI rAmAnuja’s grace took him to paramapadham. maNavALa mAmunigaL follows the footpath of his guru namely thiruvAimozhi piLLai. maNavALa mAmunigaL became extremely crazy and mad towards SrI rAmAnuja just like how his guru was. nammAzhvAr is known as “krishNa thrushNA thathvam” ,i.e., the entity that is known as “love towards krishnA”. Similarly, if one were to figuratively describe one’s love for SrI rAmAnuja, the result would be none other than maNavALa mAmunigaL. This is why he is known as “yathIndhra pravaNar”, the name of maNavALa mAmunigaL with which his identity is established comprehensively. maNavALa mAmunigaL immersed himself in the divine qualities of emperumAnAr (SrI rAmAnuja), as described in the phrases “pAlEpOl sIril pazhuthozhindhEn (periya thiruvandhAdhi 58) ” and “naiyum maNam un guNangaLaiyunni” (rAmAnusa nURRanthAdhi 102). His very nature was to deep dive an enjoy emperumAnAr’s unfathomable glorious qualities. Due to his constant experience of emperumAnAr’s qualities, he became crazy towards emperumAnAr and wanted to reach his lotus feet. His body became white and pale as he was not able to reach the lotus feet of emperumAnAr now. He yearned to reach emperumAnAr and could not bear the separation from him any further. Eventually, by emperumAnAr’s divine grace, maNavALa mAmunigaL got parama bhakthi towards the former. He celebrates the infinite mercy of emperumAnAr who fructified the desire he had towards him and made him reach his lotus feet. maNavALa mAmunigaL, in this scripture called “Arththi prabandham”, celebrates the way in which emperumAnAr graced him, with the thought that those who are in “charama parva nishtai” (regarding a devotee as their sole refuge), could take cue from this scripture and reach the lotus feet of SrI rAmAnuja. maNavALa mAmunigaL developed “parama bhakti” towards the lotus feet of SrI rAmAnuja as described in the phrase “paththi ellAm thangiyadhenna” (irAmAnusa nURRandhAdhi 108). “parama bhakthi” state is when a person can no longer continue to exist if he does not get what he wants. Here maNavALa mAmunigaL is in such a state that he cannot be without the lotus feet of SrI rAmAnuja. At this state, he expressed his insatiable desire to reach the lotus feet of SrI rAmAnuja. This is why this work is being called as “Arthi” or the desire/ love, as the pAsurams are characterized by outpourings of his unfathomable desire to be at the lotus feet of SrI rAmAnuja. The genesis of the desire to attain his lotus feet can be either the hatred towards the materialistic world or the love towards enjoying the glorious characters of bhagavAn SrIman nArAyaNan (or the lotus feet of SrI rAmAnuja for maNavALa mAmunigaL). The hatred towards materialistic world or more precisely “samsAra sAgaram” was dealt beautifully in “munnIr gyAlam” decad in thiruvAimozhi by nammAzhvAr. Love towards SrIman nArAyaNan was described vividly in “aRukkum vinai” decad in a much later thiruvAimozhi by nammAzhvAr. Likewise, the two aforementioned thaniyans namely “vambavizh thAr” and “thEn payilum thArAn” describe the hatred towards samsAram and love towards lotus feet of SrI rAmAnuja respectively. In the case of maNavALa mAmunigaL, though his “interest” (Arthi) stem from these two sources, one can see the preponderance of love towards SrI rAmAnuja is the main inspirational force, as seen in an overwhelming number of pAsurams in this work. maNavALa mAmunigaL’s time period was not the same as SrI rAmAnuja, Hence, he could not have the experience of having mingling with SrI rAmAnuja and doing service to his divine unparalleled two feet, like the other great AchAryas like kUraththAzhvAn etc. He yearned to do service to SrI rAmAnuja yet time was not helping him. However, though he could not see SrI rAmAnuja in person, he lived in the place where SrI rAmAnuja lived, i.e., SrIrangam. Given the fact that at least he could live in the same town as SrI rAmAnuja, he became happy about it and requested for the eternal service to SrI rAmAnuja as per “vazhuvilA adimai” (thiruvAimozhi 3.3.1). He mediated upon SrI rAmAnuja and requested for this eternal service to him. This is why he requests SrI rAmAnuja that he give him the mental state of vaduga nambi, as seen in the phrase “vaduganambi than nilayai en thanakkuth thandhu ethirAsA ennALum unthanakkE AtkoL ugandhu” (Arththi prabandham 11). SrI rAmAnuja is compared to be lakshmaNa who said “aham sarvam karishyAmi (I will do everything for you SrI rAma)” in SrI rAmAyaNam. SathrugnAzhvAn was one who regarded his bharatha as his everything for the latter regarded SrI rAma as everything. SathrugnAzhvAn did not even pay any heed to SrI rAma and HIS beauty. He was a one who conquered the enemy called “bhakthi towards SrI rAma”. It is considered as enemy here because it would stop SathrugnAzhvAn from doing service to bharatha. In SrI rAmAyaNam, he is described as “SathrugnO nithya Sathrugna:”. Since SrI rAmAnuja is celebrated at the pedestal of lakshmaNa who did all service to SrI rAma, maNavALa mAmunigaL’s is celebrated at the pedestal of SathrugnAzhvAn who regarded bharatha as everything. Here maNavALa mAmunigaL regarded SrI rAmAnuja as everything to complete the analogy. There is a significance in the connection between nammAzhvAr, emperumAnAr and maNavALa mAmunigaL. nammAzhvAr attained the lotus feet of the ONE who has the hue of the cloud, i.e., SrIman nArAyaNan as per the line “mugil vaNNan adiyai adaindhu uyndhavan” (thiruvAmozhi 7.2.11). SrI rAmAnuja held the lotus feet of nammAzhvAr who attained the eternal abode of SrIman nArAyaNan through HIS grace. maNavALa mAmunigaL who had no other refuge other than SrI rAmAnuja caught hold of his lotus feet and did service to them. 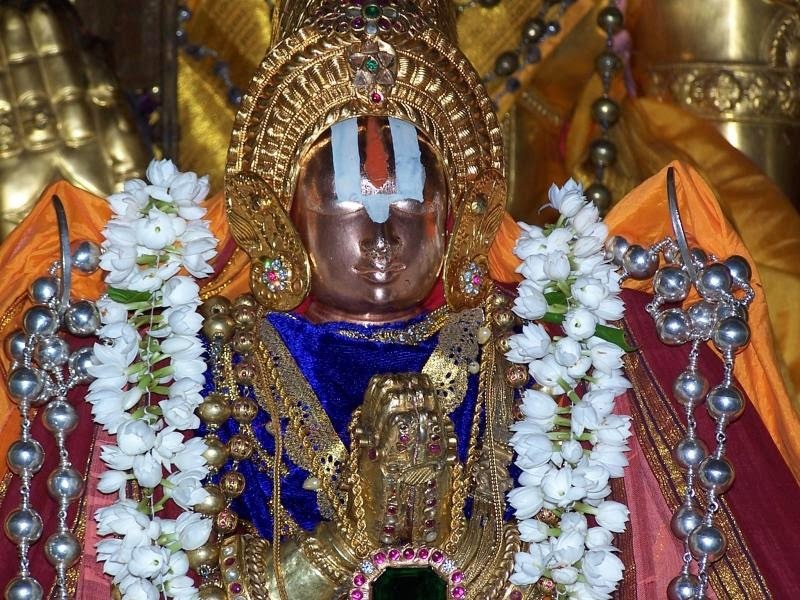 This is the significant connection between AzhvAr (nammAzhvAr), emperumAnAr (SrI rAmAnuja) and jIyar (maNavALa mAmunigaL). maNavALa mAmunigaL who is celebrated in the elite league of nammAzhvAr and SrI rAmAnuja described the glories of these two in his other works namely “thiruvAimozhi nURRandhAdhi”, “upadhESa raththina mAlai” and “yathirAja vimSathi”. In these works, he expressed his unsatiable love towards these two and their greatest works. Phrases like “parAnkuSa pAdha bhaktham” (yathirAja vimshathi 1) and “SatakOpan thEmalarthAtkE iniya pAdhukamAm endhai irAmAnusan” (Arththi prabandham 10) corroborate that. Continuing the thought, in this final work of his (Arththi prabandham) he concluded with the final frontier, i.e., “charama parvam”. “charamam” would mean final, ultimate or nothing else beyond this. When one wonders what can be one’s final destination/target (prApyam), maNavALa mAmunigaL concludes that the ultimate target (there is nothing else to reach beyond this) is nothing but the lotus feet of devotees of SrIman nArAyaNan. maNavALa mAmunigaL dealt about this ultimate philosophy in his final work during his last few days in this earth. maNavALa mAmunigaL, in his yathirAja vimSathi started with “rAmAnujam yathipathim praNamAmi mUrdhnA” (yathirAjA vimshathi 1) and concluded with “thasmAdh ananya SaraNau bhavathIthi mathvA” (yathirAja vimshathi 20), thereby talking about the greatness of prApakam (the path) that is none other than SrI rAmAnuja‘s lotus feet. In “Arththi prabandham”, he starts with “vAzhi ethirAsan” (Arththi prabandham 1) and concludes with “indhavarangaththu inidhirunI” (Arththi prabandham 60), thereby talking about the significance of prApyam (goal or target to be achieved), that is none other than doing service to the lotus feet of SrI rAmAnuja. Hence, yathirAjA vimshathi is “prApaka param” (in the mode of explaining the path) and “Arththi prabandham” is “prApya param” (in the mode of explaining the goal). At this juncture, it behooves us to take cognizance of dhvaya mahAmanthram that has two sentences. The second half of it talks about the rush that one needs to have while yearning to do kainkaryam to the divine couple of SrIman nArAyaNan and SrI mahAlakshmi. This “Arththi prabandham” conveys the essence of the rush yearned by a person in reaching and serving the target that is nothing but the lotus feet of SrI rAmAnuja. The final frontier in target is “thadhIya kainkaryam” or serving the devotees of SrIman nArAyaNan. maNavALa mAmunigaL is aware of it and understands its true nature through these pAsrurams, thereby showing it. This “thadhIya kainkaryam” of maNavALa mAmunigaL towards SrI rAmAnuja is the sole underlying current that runs through this prabandham. He expresses it through pAsurams that are multi-metered. In the first pAsuram of Arththi prabandham, maNavALa mAmunigaL sings mangaLASAsanam to SrI rAmAnuja. There is an analogy to this in SrI rAmAyaNam. In SrI dhandakAraNyam, there were lot of rishis who saw SrI rAma. These rishis were beaten very hard by various rAkshasas (demons) and rAvAna himself. They had a lot of bruises in their body and wanted to complain about these to SrI rAmA. They wanted to say “yEhi paSya SarIrANI”, i.e., look at this bruised body of ours. However, the minute SrI rAma entered the forests of dhandakAraNyam, they were completely captured by the splendid beauty of SrI rAma that they forget their bodily bruises. They were in total awe of SrI rAma’s individual bodily features that they started to fear among themselves that nothing should happen to such a divine beauty. They started to sing mangaLams (songs that ward of evils and guards a person) to SrI rAma instantly as seen in “mangaLAni prayugjAnA:”. Similarly, periya udaiyAr (jatAyu) who was in his death bed after his heroic fight with rAvAna, saw SrI rAma and was lost in his beauty even at that time. He exclaimed “Ayushmann” or “long live” towards SrI rAma. Similarly, maNavALa mAmunigaL sings mangaLams to SrI rAmAnuja‘s aprAkrutha vigraham (the body that is not made of five primordial elements of ether, wind, fire, water and earth). maNavALa mAmunigaL approached the lotus feet of SrI rAmAnuja in order for the latter to accept him into his fold. However, before submitting his request, when maNavALa mAmunigaL saw SrI rAmAnuja‘s aprAkrutha vigraham in front of him, he sang mangaLams to him, much like the rishis and jatAyu. He regarded that he should be warded of any evil first before even thinking of telling his problems. When a person does mangaLaSAsanam like this, the nithyasUris (those who live forever with SrIman nArAyaNan in HIS eternal abode called paramapadham) become very ecstatic and celebrate this person who sings mangalams. SrI rAmAnuja himself had sung mangaLams as thiruvarangaththamudhanAr says “anbAl mayal kondu vAzhthum irAmAnusan” (rAmAnusa nURRanthAdhi 6). nammAzhvAr in his 10.9 thiruvAimozhi (sUzh visumbaNimugil) visually describes how the nithyasUris celebrate and welcome a person who has done mangalams to other devotees and is en route to paramapadham. This person, at one time, considered himself to be not qualified to reach paramapadham but even then he continued to sing mangaLams to SrIman nArAyaNan’s devotees. Such a person and even the descendants of such a person is the object of enjoyment and celebration for the nithyasUris. This is what forms the crux of the first pAsuram. periyAzhvAr started with “pallANdu pallANdu” (thirupallAnNu 1) and continued to do mangalAsAsanam like “appAnchachanniyamum pallAndE” (thirupallANdu 2). periyAzhvAr not just sang mangalams to SrIman nArAyaNan but also continued to do so for HIS devotees including the likes of divine conch, divine bow so on and so forth. Similarly in SrI rAmAyaNam, one can observe that the mangalams were sung towards SrI rAma, SrI lakshmaNa, sugrIva etc as per the SlOkam “jayathibhalO rAmO lakshmaNaScha mahAbhalaha rAjAjayathi sugrIvO rAgavEnapipAlithaha”. This entry was posted in Arththi prabandham, Other on June 6, 2016 by santhanam rajagopalan.